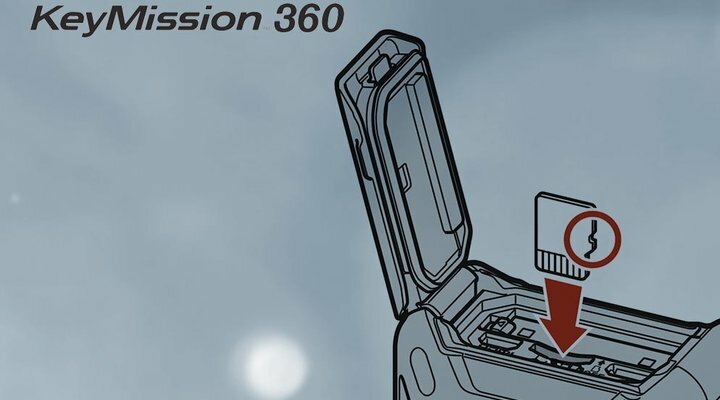 The KeyMission 360 utilizes a MicroSD media card. There are three types of MicroSD cards: MicroSD, MicroSDHC, MicroSDXC. All are the same physical shape, however the speed rating and maximum capacity of the cards vary and this is what makes each more suited for certain kinds of devices. To record video on the KeyMIssion 360 action camera you should use at least a Class 6 UHS (Ultra High Speed) 3 MicroSDXC card. A Class 10 UHS 3 MicroSDXC card is recommended for shooting 4K UHD and Full HD video. If you use a slower media card, the camera will not be able to record more than a few seconds of video before it stops recording.